Windows is often referred to as the most insecure operating system in the world, pretty much because it’s targeted by the majority of malware infections out there, but as far as security vulnerabilities are concerned, Microsoft’s platform is no longer number one. The runner-up is another Apple platform, this time iOS, with 127 security glitches, while the third place goes to none other than the Linux Kernel with 119 flaws. And then, there’s Windows, but not a version aimed at consumers. 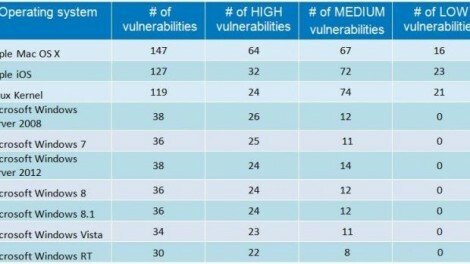 Windows Server 2008 was the fourth most vulnerable OS in 2014 with 38 vulnerabilities, out of which 26 were considered to be of high severity. While it’s fairly easy to make a comparison between Windows and its rival platforms based on these charts, especially because some claim to offer better security and privacy than Microsoft’s own product does, there’s one more chart that reveals something a bit more embarrassing for Redmond. Internet Explorer continues to be the most vulnerable application out there, as in 2014, security researchers found a total of 242 flaws, with 220 of them being rated as critical. Obviously, this isn’t at all good news for Microsoft, and just by looking at the second place, which went to Google Chrome, it’s pretty clear that Internet Explorer’s security is still falling short these days. Google Chrome had only 124 vulnerabilities in 2014. Adobe Flash Player, on the other hand, which is often criticized for its poor security, improved last year and was hit by only 76 flaws. It’s very clear that users and Microsoft cannot be satisfied with Internet Explorer’s performance in terms of security, so the company is working right now to replace its browser completely in the upcoming Windows 10. Microsoft has already started development of a new browser called Spartan, which could debut in Windows 10. It will be offered alongside Internet Explorer at first, in order to tackle any compatibility issues, but the company is willing to replace it completely at some point in the future. Spartan was already presented last month during a Windows 10 press event and a preview build is expected to be part of a new testing version of the operating system released via the Insider program. It’s always a pleasure to hear from someone with exsietrpe.